After the last supper, Jesus took Peter, James and John to the Garden of Gethsemane at the Mount of Olives. Jesus started to feel sad and miserable. Jesus knelt down and prayed, “Father, if you are willing, please take this cup from me, yet please do it according to your will.” After that, an angel from heaven came to strengthen Jesus. Jesus prayed furthermore and his sweat dropped onto the ground as if drops of blood falling onto the ground. 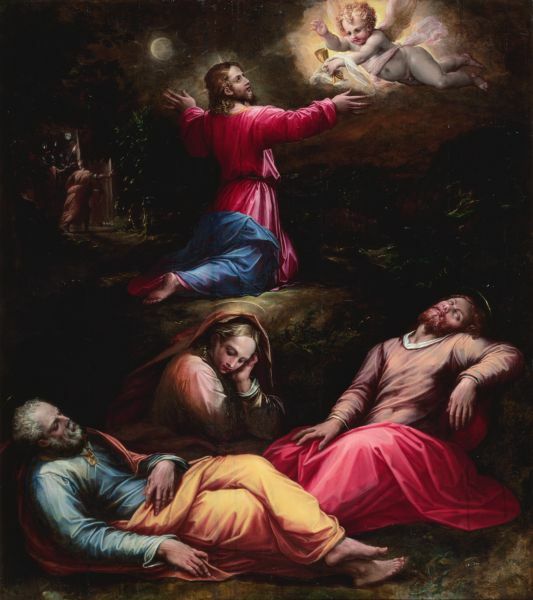 When Jesus arose and went back to His disciples, he found that His disciples were asleep. While Jesus was speaking, a group of soldiers led by Judas Iscariot arrived to arrest Jesus. Judas had told the soldiers that the one whom he greets with a kiss is Jesus. Judas went over to Jesus and greeted Him with a kiss. Then the soldiers captured Jesus. At that moment, Peter took a sword and cut off the ear of a servant of the high priest. Then Jesus put together the ear of the servant of the high priest and healed him. After that, Jesus’ disciples forsook Him and they all fled for their lives.